@hazybluedot Wow. The quote at the end of the article. Serious whataboutism goin’ on. @zigg oh yes, and really no explanation as to why we couldn&apos;t do both the things. As if fixing exlusionary language in a programming language was done *instead of* addressing systemic racism in the U.S.
@hazybluedot I must say this, Mastodon is the only place which had an overwhelmingly positive response to this news, which it deserves. That model might actually be useful as an intuition pump. Like, what would be a switch design pattern? How about a brat design pattern? You could criticize code for topping from the bottom when it's inappropriate control flow. 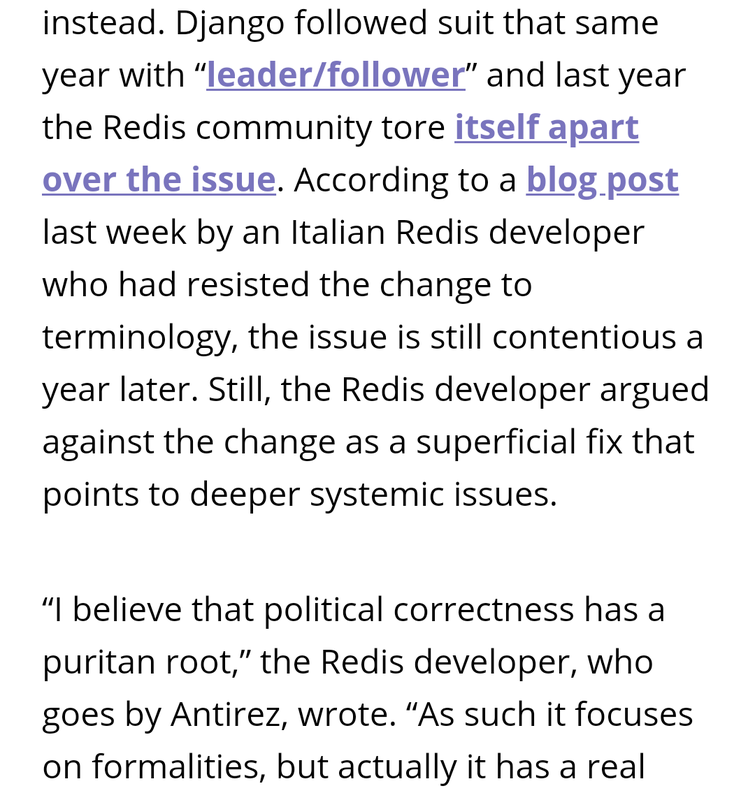 @hazybluedot the "italian Redis developer" is actually the creator of Redis. @olistik nice find. Goes to show that people who do not recognize the power in institutionalized language have always enjoyed institutions that were created by and fore people like them. How do we change the conversation to help people understand? Would you mind clarifying a bit further? @olistik I thinking being in a position in which someone can deny the power words have come from never having experienced it first hand. So in a certain way the people who deny that words matter are operating from a world view that that is in fact the Truth. @hazybluedot I often see that behavior happening without malicious prejudices involved. I could honestly not be aware of the issues a word is causing to a group of people for the reasons you described. And then there's the intrinsic relativistic power words have. It's also not something you could easily measure and this leads us to the problems faced by both parties. It's not easy to educate about the issues at stake because it's not easy to get them in objective terms. @hazybluedot On top of that there are the perils of dogmas (be them religious, political or whatever). We can realistically try to achieve constructive debates as long as we avoid dogmas. A dogma is like an impenetrable wall that blocks the development of any kind of constructive debate. 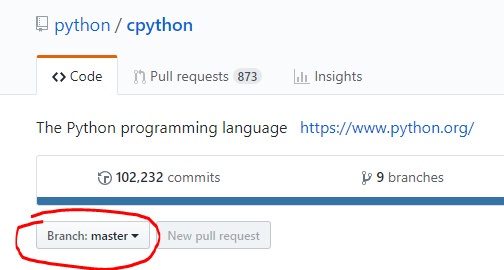 @hazybluedot The Godot Game engine removed it too, just today. @hazybluedot Yeah let's break more software projects by replacing kill, mount and touch with something else shall we? No lets break all digital electronics, because 0 & 1 "can" be used to unnecessarily sexualize the environment(their abstract resemblence to male and female sexual parts) in the least meaningful way possible. They are also exclusionary, lets switch to base 7 logic, Or 27, or 100, I guess the inclusion never stops. I would like to read some good arguments on this, but that it "can" be associated with slavery", isn&apos;t one (it&apos;s too weak), since it "can" also be related (in more meaningful ways, given the technical context) to technical concepts. Some people in that thread rightly call out the lack of argumentation. It sounds like, here is a conclusion from the "diversity" blackbox, accept it! @pranavats I don&apos;t see the argument as it "can" be associated with slavery, it very much is the reality that those terms *are* associated with slavery, that is the origin of the master-slave relationship and denying the origin doesn&apos;t make it go away. @pranavats Defending it, especially when better alternatives exist, does send the message that the tech community is more interested in preserving the status-quo--which we know to be exclusionary--than engaging in some critical self-reflection and hard work in aligning the values we say we have with what we actually do. @hazybluedot But it doesn&apos;t stand on it&apos;s own merits, the argument, it calls the origins in, to say something irrelevant to the present context. (Which I think might be Genetic fallacy, the political/social history of the term is simply irrelevant to the present, clearly technical context (though one might argue that because the language has a strong social component, the social history matters to some extent, not so much for electronics, where technical contexts are much more dominant)). @pranavats yes, I would say social context matters a great deal, and when we say "in the context of tech", the context is that tech has historically and continues to be shaped and dominated by white heterosexual men. I think it is impossible to separate the technical context from the social context, something that I think the "but in context it is harmless" arguments implicitly do. >I think it is impossible to separate the technical context from the social context, something that I think the "but in context it is harmless" arguments implicitly do. @pranavats as an example of the technical-social context: camera technology for a long time, probably still ongoing, did not accurately depict darker skin tones, and more recently facial recognition AI infamously has had difficulty recognizing darker faces. Technical is always also social, especially in the age of pervasive surveillance and AI assisted news feeds, etc. @hazybluedot Hmm. Technical may be (strongly) social, when it is public. Maybe I can&apos;t make that broad conclusions then, lets make the hypothesis more strong/constrained then. I was thinking of Jargon Engineers use. I don&apos;t think there are better words to explain Master-Slave J-K Flip Flop. One controls the other. There are non technical words like that, eg. sacrifice. Which is horrific in one context, & admirable in other. Both powerful, & with histories. @pranavats while jargon may not be "public" in the fullest sense of the word it plays a significant role in signaling in-group/out-group status. One could argue that becoming an engineer is learning, using, and internalizing the jargon. Again, going back to the context of engineering and who has traditionally been represented in the field and who has traditionally be excluded then this particular jargon is relevant in a broader public sense. @pranavats if we as a community can not come up with better metaphors for "one controls the other" than those that are based in violence, oppression, and hate, then I think that speaks to a more systemic social/cultural issue within engineering/tech, or a dire lack of imagination. @hazybluedot To make my point clear, it still seems like genetic fallacy to say the political history of master-slave relation is relevant even in strongly technical (engineering) contexts. Though social-technical contexts do admit it&apos;s relevance, to what extent, and what is it&apos;s cost (eg. cost of censorship), that remains to be discussed. @pranavats I would say that it is relevant if people say it is relevant. The language is negatively affecting people, and discouraging full participation of the public then it is relevant. For individuals to say it is not personally relevant to them does not invalidate the opposite claim made by others. What makes us believe people who say it isn&apos;t relevant over those people who say it is? @pranavats thanks for the discussion! A kind of meta-argument that I think is important to bring up but may be better suited for blog post is that western-philosophy argumentative structures are themselves instruments of oppression. The concept "genetic fallacy" that you have invoked several times depends on the assumption that it is *possible* to cleanly separate history from current usage and meaning. @pranavats to say an argument is invalid because of this immediately rejects any world view that takes history/origin to be integral to current understanding/meaning as invalid, which again has the effect of excluding groups that have historically been excluded from tech/engineering. @pranavats I bring this up not to reject any argument based on Western-philosophical logic, but to illuminate one reason why we may have difficulty reaching a mutual agreement. Doesn&apos;t mean it&apos;s impossible, just that we may have to do a bit more theoretical/philosophical work to find some common ground. @hazybluedot When they are associated with slavery, in technical contexts, they are not meaningful. When it comes to technical context, the meaningful associations with technical concepts, and their usefulness far outweighs the political connotations, which are irrelevant. I disagree with the "far outweighs" statement, especially when more accurate and descriptive alternatives exist. leader-follower, parent-child, supervisor-worker. granted, this last one normalizes capitalist power structures that also are heavily intertwined with racial oppression, so probably requires more thought. @pranavats keep in mind that their "meaningful association with technical concepts" depends on the earlier association of buying and selling human beings. The metaphor works *because* people have an understanding of what the master/slave relationship is in the context of people dominating other people. @hazybluedot I&apos;ll keep that in mind. But no it doesn&apos;t depend on that. That&apos;s what I have been saying all along. We can abstract out the concepts from concrete examples, and it is genetic fallacy to say that they still depend on details. Once we abstract out the Class of the number 3 from 3 pencils, 3 sheets, 3 stones, to simply the number 3, it is irrelevant/fallacious to say that the abstraction still depends on those specific instances of the class. Don&apos;t throw the baby out with bathwater.